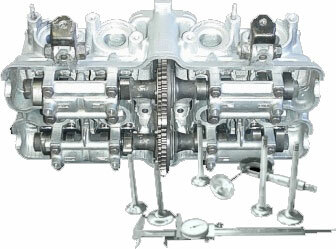 SAC Engineering are automotive cylinder head and valve specialists. Our core business is automotive cylinder heads and all cylinder head related components. 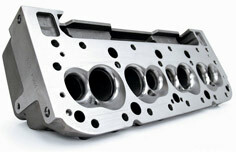 And what are the first components that come to mind when you think cylinder heads or performance? That’s right, the main components are the valves, so in real terms the business of SAC Engineering is cylinder heads and valves. Now one thing is for sure, automotive engineering has certainly changed and advanced over the years, with 1.4 litre cars making more power than big 3.0 litre muscle cars of a few decades ago were. And this is because their powerplants are far better engineered than they were back then. Also very few cars of that era, maybe even only pukka race cars, would rev up to say 8,000 rpm, but today many newer cars do that all the time. This scenario has progressed even more when it comes to motor cycle engines, for which we also make valves and repair cylinder heads. Most superbikes and quads rev up to as much as 13,000 rpm and in extreme cases beyond even 15,000 rpm. 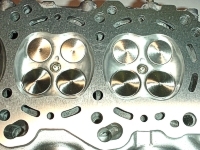 SAC Engineering are cylinder head specialists, so this is nothing new, in our high tech world, precision engineering is the order of the day, tolerances and measurements are minuscule, the days of one tenth tolerances are long gone. Nowadays high revving engines and technologically advanced engine control systems require tolerances around one-hundredth and even one-thousandth of a millimetre in the head and valve train. So perhaps now you will begin to understand that extreme attention to detail in measurement and machining is critical in each and every cylinder head and / or valve that is produced. The same applies to each and every order specifically created at SAC Engineering. And it goes without saying that this sort of quality requires time, highly skilled time we might add, and this costs. We are certainly market competitive when it comes to engineering and performance part pricing, but we are not an over the counter bargain budget facility. In the case of both our cylinder heads and valves, we engineer or create hand finished products, whether it is a refurbished OEM spec head or a full blown race head that is a hand finished work of high performance art. Similarly the range of valves that SAC Engineering offer are not production line orientated. 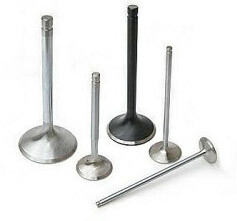 We make each valve to a highly technical and precise specification by hand and machine. The process has been optimised as far as possible to simply not compromise quality, and speed of completion is certainly not a factor, unlike in a production line where speed is everything. SAC Engineering take pride in the fact that we are probably the only company in the country that can rapidly produce a valve of any shape or size whether it is a one off item or fifty pieces in a short space of time as opposed to trying to source a manufacturer or supplier overseas. And then you got to hope that they have got your instructions right and the product actually gets to your doorstep. Many of our competitors in the cylinder head industry can modify an existing valve, which is where we started twenty years ago. Obviously we can also do that, but it is not enough in terms of the quality and precision required today. A simple refurbishing process on a cylinder head can take up to five hours to complete while a full blown race cylinder head could easily run up to fifty hours if all the effort is added together to bring you the best performance your money can buy. Valves on the other hand take anything from one hour to three hours per valve to finish properly. Here we only use the best quality parts and accessories and our valve billets or donor valves are all 21 4N stainless steel or better. So now when you put the cost of our imported billet valves together with an hour or two of skilled labour, you can quickly see that we can’t compete with production line type products that drop in a bin every minute or so. The SAC Engineering team is a dedicated passionate team of people all properly trained and highly skilled in their various departments. Each and every job we receive gets our full attention and is carefully costed and labour is charged accordingly. The bottom line is that our cylinder heads and valves are not cheap, and if it is cheap heads or valves that you are looking for, you won’t get them from us.